Instead of trying to create a single, static firmware, OpenWrt provides a fully writable filesystem with optional package management. This frees you from the restrictions of the application selection and configuration provided by the vendor and allows you to use packages to customize an embedded device to suit any application. For developers, OpenWrt provides a framework to build an application without having to create a complete firmware image and distribution around it. For users, this means the freedom of full customization, allowing the use of an embedded device in ways the vendor never envisioned. 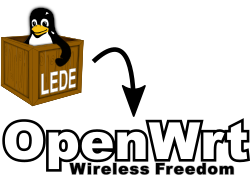 In 2016, the LEDE project was founded as a spin-off of the OpenWrt project and shared many of the same goals. The project aimed at building an embedded Linux distribution that makes it easy for developers, system administrators or other Linux enthusiasts to build and customize software for embedded devices, especially wireless routers. The name LEDE stood for Linux Embedded Development Environment. Members of the project included a significant share of the most active members of the OpenWrt community and intended to bring new life to Embedded Linux development by creating a community with a strong focus on transparency, collaboration and decentralisation. Build a great embedded Linux distribution with focus on stability and functionality. Make regular, predictable release cycles coupled with community provided device testing feedback. Establish transparent decision processes with broad community participation and public meetings. All communication channels are public, some read-only to non-members to maintain a good signal-to-noise ratio. Decision making process is more open, with an approximate 50/50 mix of developers and power users with voting rights. Infrastructure is simplified a lot, to ensure that it creates less maintenance work for us. More liberal merge policy, based on our experience with the OpenWrt package github feed. Strong focus on automated testing combined with a simplified release process. LEDE's fork and subsequent re-merge into OpenWrt did not alter the overall technical direction taken by the unified project. OpenWrt will continue to work on improving stability and release maintenance while aiming for frequent minor releases to address critical bugs and security issues like LEDE did with the 17.01 series and its multiple point releases until now. Old pre-15.05 OpenWrt CC releases are not supported by the merged project anymore, leaving them without any future security or bug fixes. The OpenWrt CC 15.05 release series did receive a limited amount of security and bug fixes, but due to its lacking integration in the release automation, no further binary image releases were made. The merged project uses the code base of the former LEDE project. OpenWrt specific patches not present in the LEDE repository but meeting LEDEs code quality requirements got integrated into the new tree while the source code has been moved to git.openwrt.org with a continuously synchronized mirror hosted at Github. The original OpenWrt codebase has been archived on Github for future reference. The remerged OpenWrt project is legally represented by the Software in the Public Interest (SPI) - an US 501(c)(3) non-profit organization which is managing our OpenWrt trademark, handling our donations and helping us with legal problems. Infrastructure formerly available under the lede-project.org domain has been mostly moved to corresponding openwrt.org subdomains and redirects were put in place when appropriate. The name OpenWrt stems from the beginning of the open wireless router movements, starting with the first White Russian releases for WRT54G routers, marking the start of future wireless router firmware development. The name LEDE is an abbreviation for Linux Embedded Development Environment, a reference to its flexibility and embedded buildroot origins, making it a solid choice for embedded Linux applications far beyond the wireless router and network appliance realm. IRC meeting logs done during the LEDE fork can be viewed here.